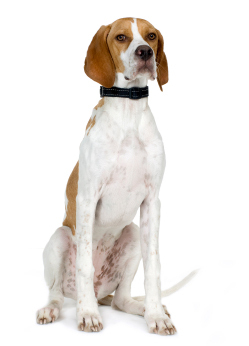 Learn about the temperament and personality of the Pointer. Discover what he's like to live with, his traits and characteristics and how he generally behaves. And look at lots of Pointer photos. The Pointer is good-natured, eager-to-please, and reliable. He's very good with children. He's aloof with strangers. He has strong hunting instincts and will chase any creature that runs away from him. He's active, athletic, agile and fast on his feet. He possess a lot of stamina. He likes to spend plenty of time outdoors running around. He prefers to be indoors and apart of the family. He gets along very well with other dogs and is never aggressive with them. His behavior can turn destructive if he's bored and has nothing to do. The Pointer is moderately easy to train. He learns new commands at the average rate. He is neither difficult nor easy to train. The Pointer sheds a fair amount of hair. You'll find hair stuck to your couch, carpets, clothes and everything else in your home.